Our house. Photo circa early 1900s. 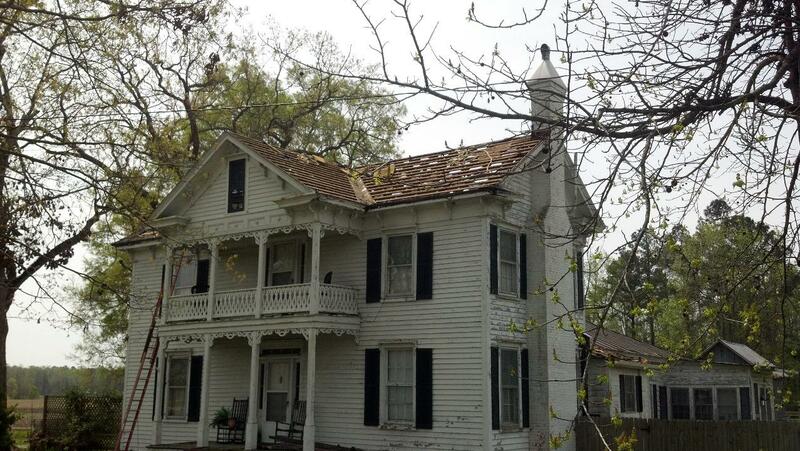 When our house was built in the 1800s, the roof (like many of the era) was comprised of cedar shake shingles. 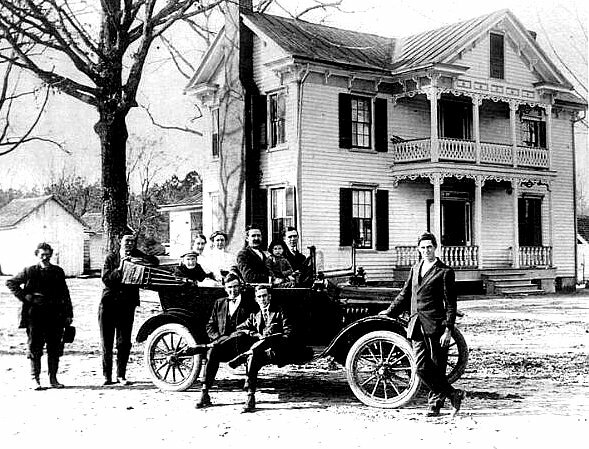 In December 1922, a historic fire broke out here in New Bern. A downtown home had caught fire and was quickly spreading -- in the end, destroying over 1,000 homes and businesses -- all due to the cedar shake roofs allowing the fire to wick from one structure to the next. 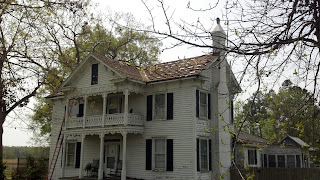 Our house was far enough removed from the downtown area to not be affected, but the town quickly outlawed wood roofs after this and remaining rooftops were covered in metal. We didn't know this until the past year. 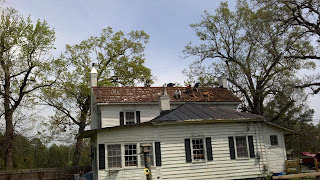 We didn't find out by choice (not that we aren't interested in local history), but instead we learned this when Hurricane Irene (Aug 2011) attempted to remove our metal roof. 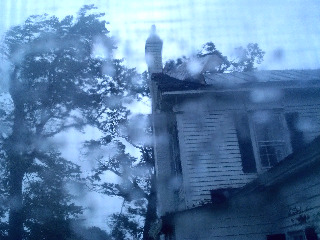 We were enduring the hurricane by camping out in the living room when, late in the storm, I noticed small pieces of wood raining down outside our window. We ran out the backdoor only to find that the winds had peeled up a large section of our metal roof to expose the original cedar shake roof that we didn't know existed. 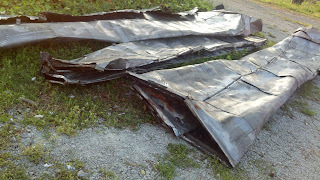 It would be weeks later when we would find out not only about the historic fire from a roofer evaluating the damage for a replacement estimate, but also that the metal roof covering the shingles was the original roof put on in the 1920s due to the "no wood roofs" law stemming from the fire. In nearly 100 years, the hand crimped, standing seam custom metal roof had never been replaced. 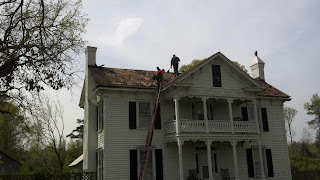 Yesterday, the lifespan of not only the metal roof, but the underlying original cedar shake shingle roof, came to an end. 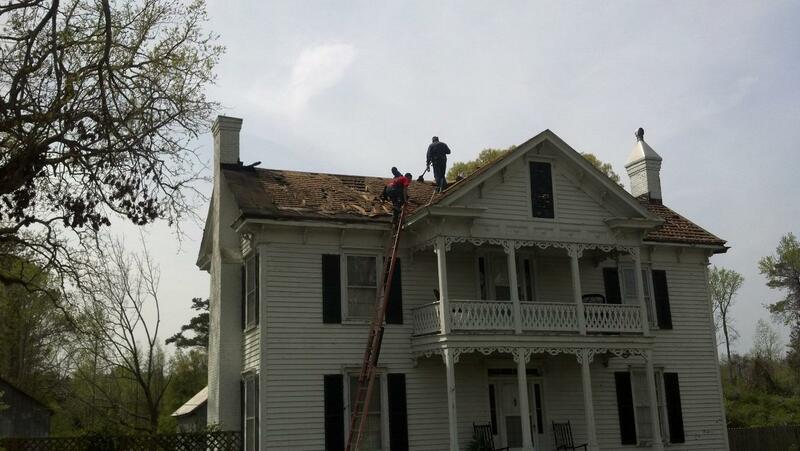 Roofers began the project by first removing the old metal roof, and then painstakingly chipping off the original cedar shake shingles that have been protecting the house since the 1800s. The metal is now cut and rolled up in our yard to be recycled. 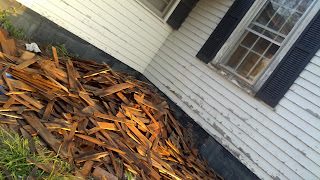 There are piles of shingles all around our house now, waiting to be stacked and moved. We will be saving them to repurpose later. The roofers took the roof down all the way to the framing, put on new plywood, and covered it in tar paper before nightfall. We are now awaiting the arrival of the new metal so that phase two of the process can begin... the first completely new roof for this house. 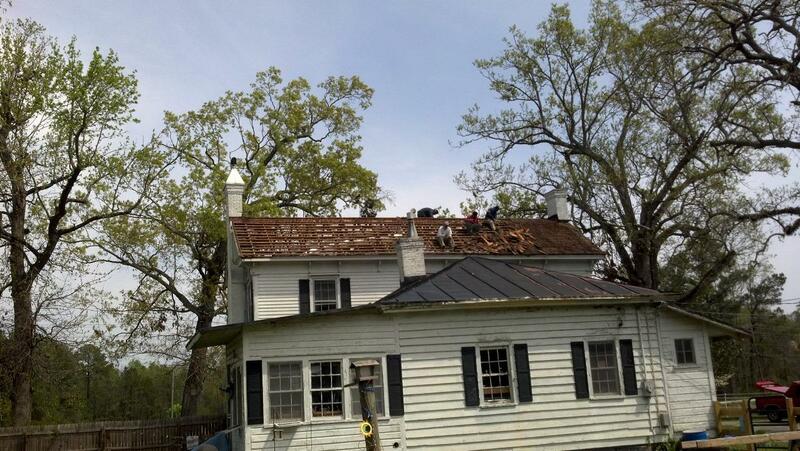 Roofers working to pry off every last cedar shingle. We knew when we bought this place eight years ago that we would at some point have to replace the old roof, we just didn't know it would be so soon. This bittersweet project is necessary and will protect the house for many years to come, but sad nonetheless to see such a big piece of history going away. Most interesting post. What a Beautiful home you have. Thank you! And I appreciate you stopping by! That's really interesting. I wish we had a metal roof. The cedar is nice but as you saw, the metal lasts so much longer. You have a beautiful home! Thank you! We love the metal roof (especially when it rains... the sound is very soothing!) and you can't beat how long they last. This one stayed on for at least 90 years and may have made it to 100 if the hurricane hadn't have compromised it. What a beautiful house! I love the old pictures and the history. We just replaced the cedar shingles on our old house too, so I know what you've been through.